Dave Kuharchik: There is an issue today involving a home inspection we’re going to get to the bottom up of on “The Law & You,” back with us attorneys Greg Fellerman and Ed Ciarimboli thanks for being here. Ed Ciarimboli: I can’t believe the months’ half over. Dave: Can you imagine, it’s just flying by like it only lasted ten minutes. Greg Fellerman: Yeah, spring’s coming. Dave: Yeah, we’re getting closer. Alright, here’s our question today and this one involves a home inspection. Of course, I’m sure other people will be purchasing homes as the weather gets warmer now. “There is a house my wife and I put a deposit on. The house though did not pass inspection. Can we do anything to get our deposit back?” Mark in Lewisburg wants to know. Ed: Well Mark, probably yes, but we need a little bit more information on this particular issue because it really, I think, would depend on the type of real estate agreement that is signed. If you signed an agreement that subjected the house you were buying to inspection and the house didn’t pass inspection, then yes you’re gonna be able to get your deposit back, but depending on what the particular agreement was, contract I think, it’s really going to dictate whether you get your deposit back or not. Greg: Right, whenever you enter into real estate agreement its always a good idea to put some contingency provisions in their: subject to inspection, financing, those types of things so that when you sit down with your real estate agent and your real estate attorney that’s something that you always want to discuss. And the other thing is when you sometimes look at the inspections closely ‘cause inspectors come in and pick up everything, they do a great job, but sometimes you have to kinda weigh it out and see if it’s really worth blowing a deal over, some things that come up in the inspection. Your real estate agent says sometimes inspections kill a lot of deals. You kinda have to have a temperament on how you want to handle them so you just look at your inspections and see if it’s a deal killer. Dave: Certainly makes sense. Our viewers that need your legal help, how can they reach you? Greg: They can call us at 570-714-HURT or see us on the web at 714hurt.com. Ed: If you have your real estate contract, email it to us and we could take a look at it real quickly for you to answer it, give you a more definitive answer on this particular question. 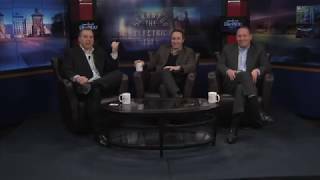 Dave: Results matter, attorneys Greg Fellerman and Ed Ciarimboli, guys thanks so much. Ed and Greg: Thank you. Dave: Alright, PAHomepage.com or “The Law & You” hotline are open to get a question here on the show.